Blockchain and Ledger publish a hardware walletsteemCreated with Sketch. Blockchain has in cooperation with ledger created a new hardware wallet, that should be very safe and which is exclusively compatible with the Blockchain Web Wallet. The Blockchain Lockbox should use the strengths of the two products and set a new standard. It has its own firmware as a standard version, which allows the exclusive features of Lockbox. Lockbox is therefore not compatible with Ledger Live. The lockbox is a reflection of what our two companies do best. We have created an elegant software and hardware integration that offers more functionality than was previously the case in our rooms. We're happy to offer Lockbox to Blockchain users so they can seamlessly manage their funds online and offline, seamlessly. @tradewonk, Great to know about the Blockchain Lockbox. And in my opinion it's really sounding an effective Partnership and this is just an start and in future we will going to see more and more Collaborations and Partnerships in the Crypto Economy and i am really excited to explore the new opportunities. I have a Ledger Nano S and love it. 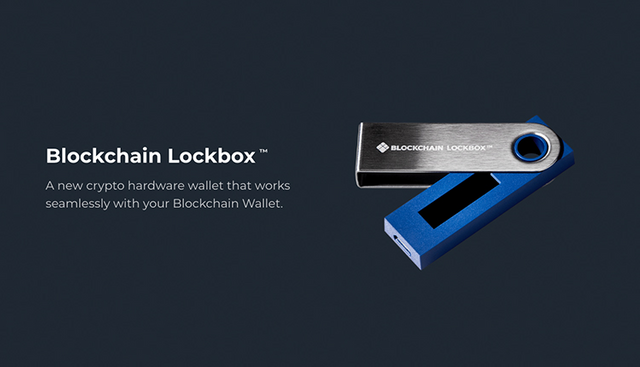 Lockbox, It sounds cool.hope that it will be safe to store crypto. Very informative article. Good step from both towards a secure and pleasant crypto environment. Ultimate target to achieve more adoption through providing safety features with ease. Your UA account score is currently 4.624 which ranks you at #1686 across all Steem accounts. Your rank has dropped 355 places in the last three days (old rank 1331). In our last Algorithmic Curation Round, consisting of 438 contributions, your post is ranked at #225. Does this device only store bitcoin or it store all kind of alt coins?